Planning a road trip along the west coast? The west coast is perhaps most popular for the beautiful Big Sur along the California Coast, which boasts so many attractions and beaches such as the popular beaches in southern California. Having said this, you'll be glad to know that there are many more places to visit on the west coast of USA and stop along the way than meets the eye! Besides the California coast, you have the beautiful Oregon coast and the dramatic coastline of Washington State, which offers one of the most scenic drives in the US! Below we have listed fantastic places to visit on the west coast and natural attractions to see on the way! 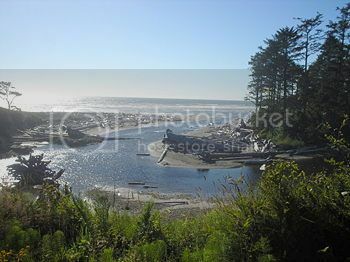 Kalaloch is located within the Olympic National Park, just off highway 101, and it’s one of the best spots to enjoy beach hiking and observing coastal birds such as bald eagles and gulls from the bluffs. 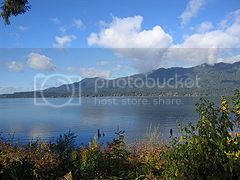 Lake Quinault is located also off highway 101 within the enchanting Quinault Rain Forest, and if you love nature, Lake Quinault should be an absolute must place to stop along the way just to see the gigantic old trees and massive slugs! 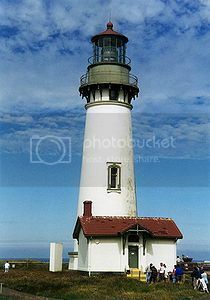 Both Cape Disappointment Lighthouse and Willapa Wildlife Refuge are a little off route (in the town of IIwaco) if you’re planning to stick on highway 101, but if you ask me, they're worth the small detour! Willapa Wildlife Refuge is a great spot to enjoy more wildlife viewing and see animals you wouldn't come across often such as the famed Roosevelt elk. 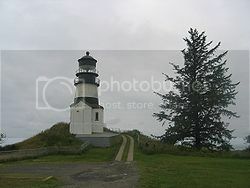 Cape Disappointment Lighthouse is one of the few remaining west coast lighthouses built in the 19th century and seeing this gem up-close is quite remarkable! 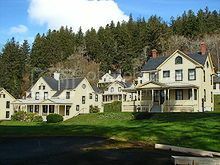 Fort Columbia Park is located adjacent the Lewis and Clark Historic Park and is one of the top places to visit on the west coast of USA. Fort Columbia Park boats twelve beautifully constructed 19th century wood-frame buildings (see picture) which you can explore on guide-tours, as well as an interesting interpretive center where you can learn more about pioneer life on the Pacific Northwest. 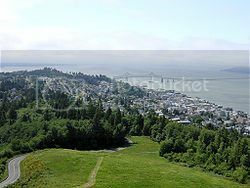 The town of Astoria is another of the top places to visit on the west coast of USA simply because of Astoria’s 126-feet high column where you can enjoy marvelous views of the ocean and the town itself (see picture). By the way, did you now that Astoria was the location for the blockbuster movies “Free Willy” and “Kindergarten Cop”. 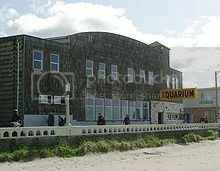 The town of Seaside is another worthy stop along the west coast, if anything, to see the wonderful Seaside Aquarium. 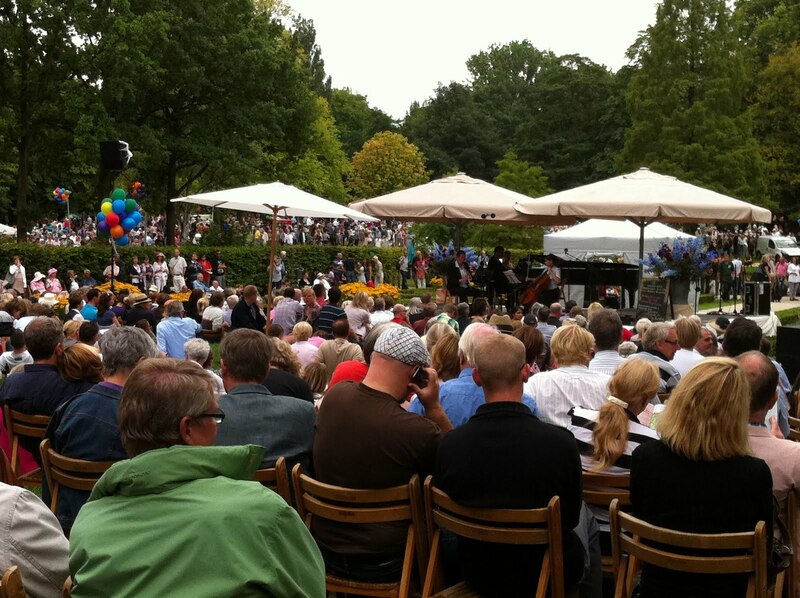 Seaside is also a great town to visit (especially in summer) because of its regular events and festivals such as Hood to Coast relay race, Miss Oregon Pageant and Artwalk. 1) Because of the famed Tillamook Cheese factory. The Tillamook Cheese factory has a visitor’s center open all year long where you can see how cheese is made, learn about the cheese making process, and enjoy tastings! Newport is another of the must-stops along the Oregon Coast Highway, so be sure to add to your list of places to visit on the west coast of USA. Newport, not only boasts the fantastic Oregon Coast Aquarium, but also Yaquina Lighthouse (the tallest in Oregon), and the renowned Rogue Ales brewery where you can enjoy some great brew tastings! 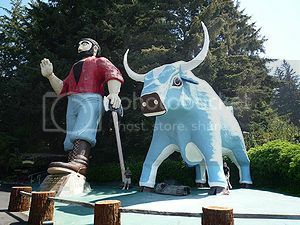 The town of Klamath California boasts the interesting attraction of Trees of Mystery, which is a cool place worth stopping by, just to see the massive statues of Paul Bunyan and Babe the Blue Ox (pictured). Fort Bragg is another stop along Highway 1, which you can’t simply past by, as it is one of the best places to visit on the west coast of USA to enjoy absolutely picturesque vistas of the Pacific Ocean. Besides the views, the Mendocino Coast Botanical Gardens are also worthy of a visit in Fort Bragg to see its amazing collection of plants and gardens. 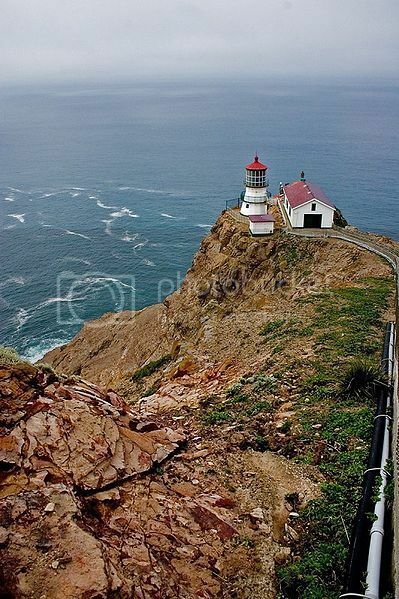 Point Reyes National Seashore Park is an absolute gem of natural attraction that the California coast is known for. Point Reyes Park offers a great opportunity to enjoy breathtaking coastal views because of hiking trails such as Bear Valley Trail which run along the cliff. 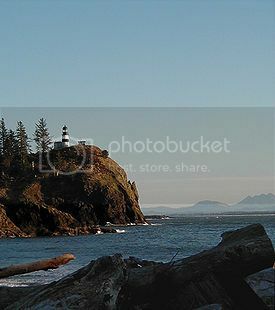 There is also a historic lighthouse within the park (see picture) where you can get memorable vistas. Fort McArthur (pictured) is another great attraction worth adding to your list of places to visit on the west coast of USA.. 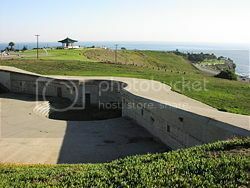 The Fort is located in the Los Angeles district of San Pedro and it isn’t only a great place to learn and see old military displays, but also to enjoy events such as the Great Los Angeles Air Raid, which is a cool live re-enactment where people dress in period costumes to recreate the LA Air Raid event that happened on 1942.